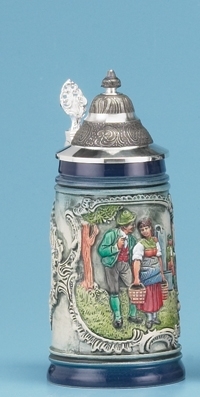 Beer Steins › Beer Steins-German Traditional › Heritage Scenes Beer Steins › RUSTIK BLUE TRADITIONAL STEIN. Traditional tapered shape. Raised-relief handpainted decoration. Amidst a background of blue and grey there is a gentleman courting a lady as she carries water going about her daily duties. This is a beautifully detailed traditional scene.